The 2012 summer movie schedule is starting to line up and like most summers I look forward to going to the movies even though I have a pretty good home theater system. I think I get a little of the excitement from my father who would often go to the movies no matter how bad the movie or reviews were. My wife on other hand is more discerning and only wants to go see the artsy Oscar films that can put any person to sleep (at least the ones I have seen). Growing up there were some films that left an immeasurable impression that even to this day I still enjoy watching. These films made me enjoy watching movies and appreciate the art of making a film. Okay, I am a child of the seventies. The first movie that left an impression on me was Star Wars. A galaxy far, far away inhabited by fantastic aliens and robots. Robots were more than moving boxes in Star Wars. They were mechanical beings that you could interact with and had personalities of their own. 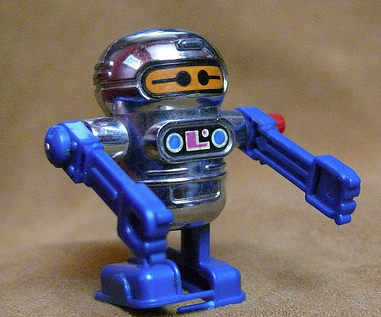 I grew up wanting to have my own robot. I even tinkered with building one from a Radio Shack kit I got for my birthday once. However, it really was not the same. As technologists, robots are where we wish computers would evolve to – the next evolution of technology. We might be some ways off. Until we can get our very own C3-PO in our home, we will have to live with the robots we see in movies. There are many, many more robots that I could name. Who are your favorite robots? My Friday Post: CIOs In Movies and Television? Why are there no movies or television shows about CIOs? There have been countless shows about doctors, lawyers, cops, civil servants, teachers, traders, but none about CIOs. I did a google search and came back with no results. The only movie that comes to my mind was with Harrison Ford in Firewall where he plays what appears to be a chief security officer. There have been sporadic episodes where technology people have been portrayed in the stereotypical “nerd” fashion but never any in which we are portrayed in a positive or heroic light. So why? Is the role of CIO not glamorous? Is technology still portrayed as being “nerdish” or “geekish”? Or is it that Hollywood believes that a CIO will not draw viewers?